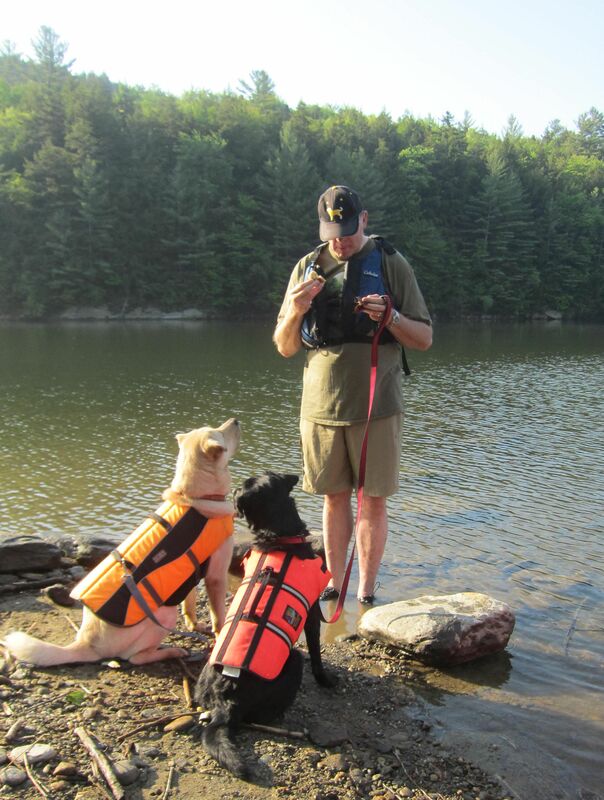 Peaceful Breakfast paddle | Vermont Paddle Pups! So on this day, predicted to be extremely hot and muggy, we get up bright and early, and head to the nearby canoe access. This particular access had very low water levels all last summer, so it was nice to take advantage of the recent heavy rains,,,the water level was quite suitable, and hopefully will stay so. This access is only 3 miles from our home. We were paddling by 0630; the dogs did very well. Edgar actually spent much of the time in his own stern compartment. When he got a bit wiggly, he went back into the stern compartment with his dad, We had to negotiate a bit of floating debris, left over from the recent storms. Thankfully, Edgar did not decide that all those sticks passing by on the water were just waiting for him to pounce! We paddled for 45 minutes, to a spot where we could land the canoe, and have a wonderful early morning muffin and coffee stop. We love our JetBoil stove! The dogs got to run around a bit, but no swimming on this stop. We have actually hiked to this spot from a trail system located adjacent to the reservoir. We passed a few fisherman on our way back to the canoe access. The dog were attentive, and well behaved; they showed off nicely! Next trip, we may try Edgar in the bow compartment, behind his dad…we’ll see how that goes. ← Only Our Feet Got Wet!